Google Docs Presentation of Research Essay: "A Jungian Analysis of the Creation Stories, Noah, and Jacob and Esau"
Becomes featured faculty on the Faculty Highlight section of the Instructional Technology Newsletter, a bi-annual newsletter that is distributed to colleges and universities in the state of Colorado, for utilizing innovative and effective teaching practices in the classroom and in online course environment. Researched and developed strategies for converting traditional ENG 090: Basic Composition textbook to E-texts, audios, videos, and Open-Access texts options. 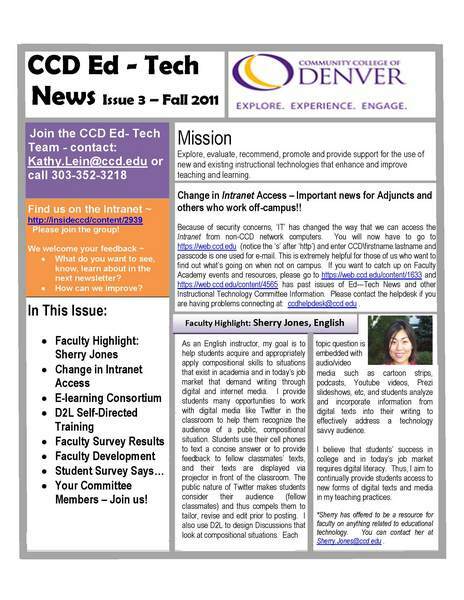 "Sherry Jones, an instructor for both the Center for Educational Advancement and the Center for Language, Arts and Behavior Sciences at the Community College of Denver (CCD), has used Web 2.0 technologies to redefine teaching and assessment practices in composition." "English instructor Sherry Jones showed us how she uses YouTube to engage and teach her students and I bet it is not in a way you have seen before"